Workshop #22: ShopQuest 2014- Lathe Set UP!! I am happy to report that a big part of ShopQuest 2014 has been completed. My new lathe is on a stand and all set up to try out. It was built using left over 2×4s and a new 2×12 board. Seems pretty sturdy so far and considering I am not planning on throwing a massive chunk of anything on it I think it will work well. I am planning to hopefully turn something this evening. Have to take a look to see what I have that is prepped to go. Otherwise it will be a few days. The set up will take little getting use to but I think it will work fine, otherwise I will just move it back under the shelves, but I am hoping to have freed up some space for some other tools now and get them out of the middle of my floor. So what’s left? 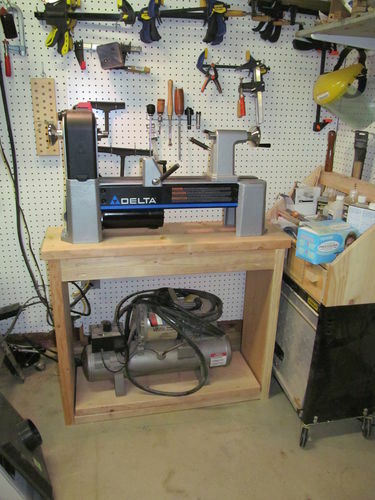 I now need a stand for my sharpening wheel and also one of my belt sander. Contemplating a flip top style to accommodate by belt sander and scroll saw since I don’t use it often but would like to have it a little more easily accessible. We’ll see. Also thinking hard about my workbench, it more than often just collects junk and I am not sure when the last time I used it for a project. I tend to set up a temporary space on saw horses when I need the open space. Just did it about 5 different times in the past 2 weeks. Does anyone use that approach instead of having a dedicated bench? I have decided to keep my wood rack for this year at least but will be making a few edits to it and getting rid of a few more pieces of wood that have been there for a bit too long. But he good news is that this is what the shop looks like now that I got rid of some excess piles. So much happier though I still do have to figure out a bit of space for a few other things, including a scrap wood box for my daughter. More to come. 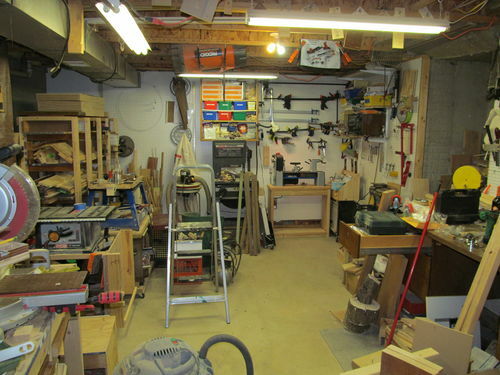 Looking good, your shop is about the same size as mine….but much more organized. I do have an actual workbench—sometimes even gets usde. The H-F folding “mates” that I have had for years get more used than the workbench! I will have to say they owe me nothing!—I have used them so much it is nuts. I also have some metal folding sawhorses that get alot of use. I can set them up where the light is better and get on all sides easily; or move the thing to get where I need to go. In fact I recently broke the #2’s origanl mdf junk top. Made a new one from pallet 1 by stock and made it bigger. I also made dome new “dogs” for it from scrap. I now have repalced both tops with homemade ones. Not bad for 15 years or so. Cool lathe stand, only I don’t see it in wheels. I have a few bench tools that are crowded and need some more space. Looking into the flip top myself, still getting ideas. At least you show good progress in your shop. Keep on building your dream. @Vince- trust me it looked a lot worse at the beginning of the month. @rjR- Thanks for the thoughts on the bench. I am going to look at seeing if perhaps I can reduce mine in size a bit. I like having the storage in it. @Dave- Thanks. I actually have wheels sitting here and had some good ideas for building it with wheels, it finally came down to getting it built and usable. So this may be version 1.0 not sure. I just tried it out and works quite well. Looks nice and sturdy… before you know it you’ll be done building your shop!